A new era that becomes the next step in currency development has arrived. The cryptocurrency technology has created a huge trading value through the idea it doesn’t need using of third parties. Decentralized exchanges, are using blockchain technology as a backbone – an amazing phenomenon that makes possible trading process, where it is easy and safe to buy any cryptocurrency you want, using fiat. The things that makes everything to flow smother are trading platforms and exchange sites – centralized resources collecting and processing all the information about the clients. Using of decentralized exchanges – also known as DEX – becomes a trusted tool that supports traders to make all the transactions to be safer and all the information regarding the buying/selling being recorded in the blockchain database. As a consequence, all the retail investors implement their ideas via blockchain technology, without any other intermediary services. – A great number of traders – In order to offer liquidity to the process, it helps to correct the price due to all the open trading affiliates and also, helps to avoid the manipulation of the market. – Few or just one pricing pairs – More flexibility regarding buying and selling currency for all the traders. – Low taxes for all the users – In order to buy more, clients have to pay fewer fees. – Increased transaction speed – Using of blockchain technology allows all the clients to track all the market prices faster, that guarantees a much more efficient investment. -A friendly and easy to use interface – Beginner and advanced clients have different types of interface, from what they can choose. – Scalability – It is all about the currency price: when it fluctuates and becomes higher, there are some trading spikes, where nobody will notice a price change. Here is a table of the total sales done in a day by some of the most major centralized exchanges. The time set for these values is December 2017- January 2018, when Bitcoin got to the top of its previous values. – Updated security from a third-party (neutral intermediate): There are no risks of the exchange platform to be hacked because your cryptocurrency is sent only to a wallet you own, and not controlled by anyone not directly involved in the transaction. 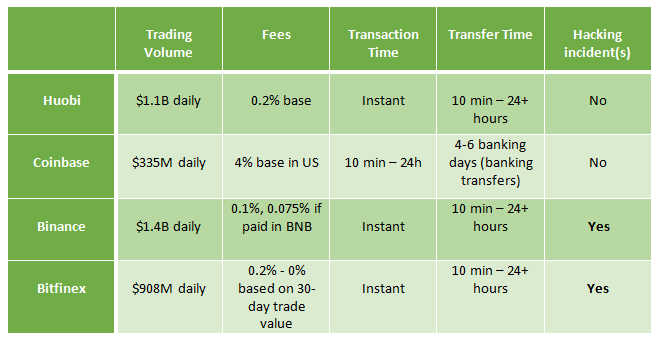 – Faster transactions: The delivery is happening even if there are not working hours and even if there is a bank holiday. – Trading flexibility: The payment for cryptocurrencies can be made in any other currency (especially FIAT). – Fragmentation of crypto-markets: the crypto-markets have more freedom, so more fragmentation; this is the effect of separating the crypto-markets into many pricing pairs. – Anti-money laundering / KYC identification: The regulations require the client to submit all information about his identity, who is the owner of the funds, the source of those funds and how much he owns. – Front end running issues: Buyers with sellers are hard to match in full compatibility. This usually allows third-party members to interfere and gain small but easy profits. Actual technical development for some of the leading decentralized exchanges. The value of the current market needs is over 165 million euros, according to CoinMarketCap. This tends to be the best scenario for a fully-decentralized exchange viable technology. The purpose of this technology is to satisfy the needs of retail traders. If this phase of the Blochain maturity continues on a longer-term basis, retail investors will soon represent about 10-12 % of the total Blockchain volume. Regarding this information, the decentralized exchanges could be the main source that will take a major part in the cryptocurrency market. When it comes to price analysis, decentralized exchanges could be around 1-4% from the total cryptocurrency market volume and the numbers will continue to rise. In the next 2-3 years, It can increse by 10-15 times. The idea is developing decentralized systems, and to involve centralization, while necessary. The technology of Decentralized Exchange is in development and even if it is efficient in the opinion of many, many traders and investors still prefer trading on a solid platform which guarantees their funds offers safety and works with known banks. Creating an account on a trading platform is also very intuitive to use and once your identity has been verified, people can already start trading.